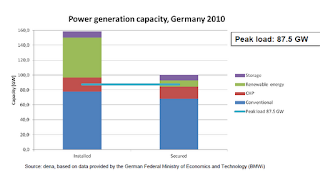 The divergence shows the challenges for traditional power generators posed by German energy policy, designed to cut carbon emissions while phasing out nuclear power. Wholesale power prices have dropped 11 percent this year as wind parks and solar farms join the grid. The difference between fuel prices means generators lose about 13 euros ($16.80) for each megawatt-hour they produce from gas, while making 10 euros from coal. The entire article can be read at Bloomberg.